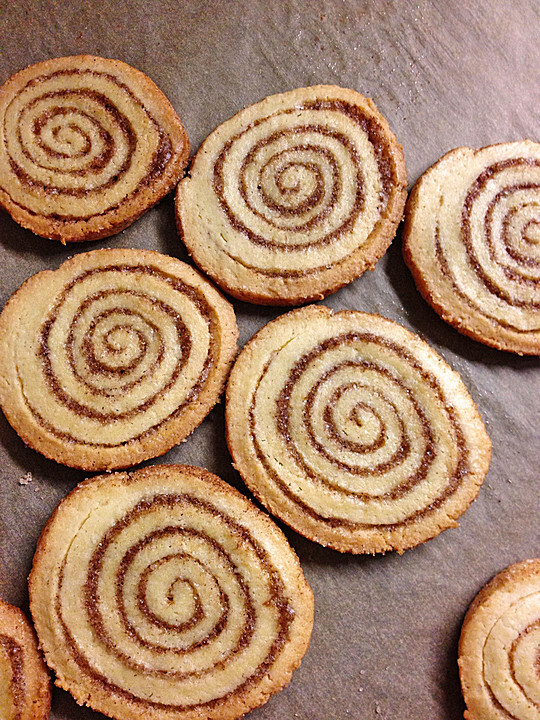 German cinnamon cookies are great cookies for the holidays and Christmas. Germany is the country of Christmas traditions, and baking before Christmas is very popular. Of course you can get all these nice Christmas cookies in the bakeries, still it is fun to bake your own Christmas cookies. The cinnamon cookies should be kept in a tin box. They are not soft cookies, they are more like "Kekse" like the Leibniz butter cookies, they are somewhat crunchy. Happy Baking! - Mix soft butter with cream cheese (use a hand mixer). - Add 80 g sugar, vanilla sugar and egg yolk (First separate the egg yolk from egg white). - Mix flour with baking powder and sieve it, mix well. Knead the dough. You should get a dough that can be rolled and should not be sticky. If it should be sticky add a small amount of flour. - Roll dough in between 2 layers of transparent foil (7.5in x 10in or 20cm x 30cm). - Remove upper foil and brush the dough with melted butter. - In a small bowl mix remaining sugar with cinnamon. - Sprinkle over the dough (use enough, so that the dough is covered). Keep 1 tbsp of the mix and place it on a big plate. - Roll the dough starting from the smaller side. When done roll it in the sugar-cinnamon mix on the plate until completely covered. - Wrap tightly in transparent foil and keep in fridge for 3 hours. - Pre-heat oven to 350 F, layer baking tray with parchment paper. - Unwrap the dough roll and cut in 1/2 cm (or quarter of an inch) thick slices. - Place them on the baking tray, bake for about 12 min - They should not get brown. - Let cool off on a cooling rack.